GEN’L CHARACTERISTICS: too multi-variegated but generally flat-shaped seeds with purple & violet hues (lots of anthocyanin); tannins providing long finish, body & breadth require add’l processing (longer ferment, higher roasting temperature, extra conche) to mitigate inherent bitterness, acidity, & astringency; power over finesse. f/k/a ‘Forestero’ – the warhorses of cacáo… carrying an undeserved reputation as bulk commodity. A well-groomed Amazon bean can be as flavorful as most any cacáo. Considered generic because it a) accounts for 90%+ of worldwide production due to its toughness, adaptability, & disease-resistance; b) is ubiquitously peddled in inferior candy products by global manufacturers like Cadbury & Mars; & c) often has off-flavors, the result usually of poor processing (under-fermented, insufficiently dried, etc). Fact is, a well-husbanded Amazon bean can be as flavorful as most any cacáo. the C-spot™ has abandoned the use of the term ‘Forastero’ which presumably derives from the watershed event of 1757: trees once considered Criollo (or “native”) in Venezuela were transplanted to Trinidad that year where they instantly became forastero (meaning ‘stranger’ or ‘outsider’ in Spanish & commonly translated into ‘foreign‘). 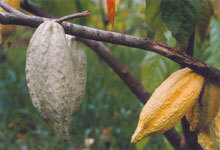 Just as its subspecies name – Theobroma cacao ssp. Sphaerocarpum, referring to spherical shape – classified by Cuatracasas is erroneous & outdated, so too ‘Forastero’. It has come to refer haphazardly to anything originally from the Amazon River Basin, a lazy mob-term considering the Amazon teems with enormous variety which no single label could possibly cover – the English equivalent of ‘it all sounds Greek to me’ – adding little detail or specificity to the true nature of what it purportedly describes. And, of course, the obvious / bordering the ridiculous: native cacáo trees thriving in the Amazon are anything but foreign. The Amazon has such an abundance of cacáo growing wild in its natural state or only slightly altered by humans (in which case it’s referred to as ‘incipient domestication)’, on an absolutely staggering scale, that ancient peoples living along the many riverbanks saw no need to cultivate it, unlike Mesoamericans who had to extensively domesticate the tree. In the Amazon it’s practically all around for the picking. Jesuit Fr. Cristobal de Acuña published New Discovery of the Amazons in 1641 “with little labor these trees may be picked on this river without any help from art, nature alone covers them with abundance of fruit”. Only about a quarter of all cacáo there has ever been explored… even less in key western tracts. Research scientist Juan Motamayor sums it up: the Amazon contains the most biologically diverse tree communities ever encountered… averaging 300 species per hectare. Naming a thing by its provenance means calling it equivalent to the reality it help shape. The apt bromide ‘call a spade a spade’ applies here; to compel naming it what it is – Amazon. Though this appears to be just swapping out one term for another, it frames the source contextually, both in its natural & cultural surroundings, & appeals for greater denominations in the future, rather than the loose casual tags currently in vogue. 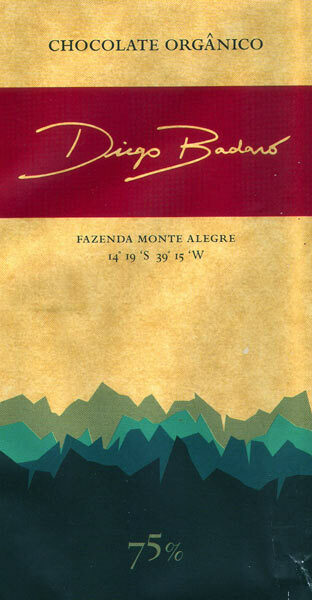 By way of example, Dagoba deserves credit for being perhaps the 1st commercial maker to cite ‘Peruvian Amazonia’ as a varietal on its Milagros bar. This may fall short but it’s a start to more accurately classify the variety within the species as a whole. 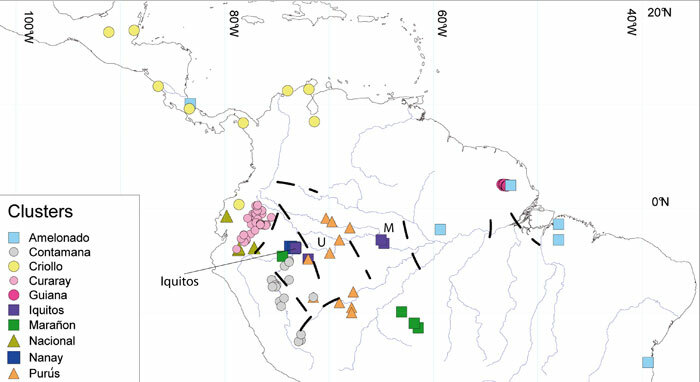 The news continues to unfold: Dr. Motamayor, in consortium with other botanists, has discovered unexpected riches & classified Amazon cacáo into umpteen genetic clusters, named primarily by phylo-geography: Amelonado (in Brazil), Marañon (Brazil/Peru), Curaray (Ecuador), Boliviano (Bolivia), Guiana (Guyane), Contamana, Huallaga, Iquitos, Nanay, & Purús (all Peru) + one pending in the Ucayali valley. Hopefully cacáo growers & chocolate makers will take note, both in more careful selections & accurate presentations, so that diversity will grow rather than shrink, expanding the complexity of the world’s greatest flavor.